If you’re still looking for that just-right, oh-so-unusual holiday gift for a friend or loved one, I’ve got the answer for you. Buy them a copy of San Francisco Panorama. 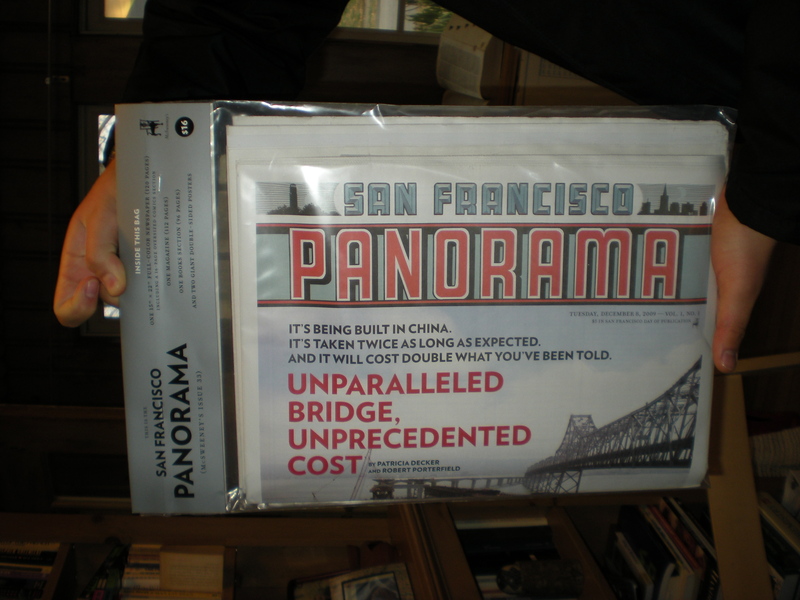 Panorama is a newspaper – but it’s not like any newspaper you’ve ever seen. Published on December 8, 2009 by McSweeney’s, an independent publishing house founded in San Francisco by writer David Eggers, this is not like any newspaper you’ve ever seen. Printed on broadsheets and coming in at just over 300 pages, this one packs a wallop. It’s got arts, sports, news, food, book reviews (96 pages! ), comics (16 pages! 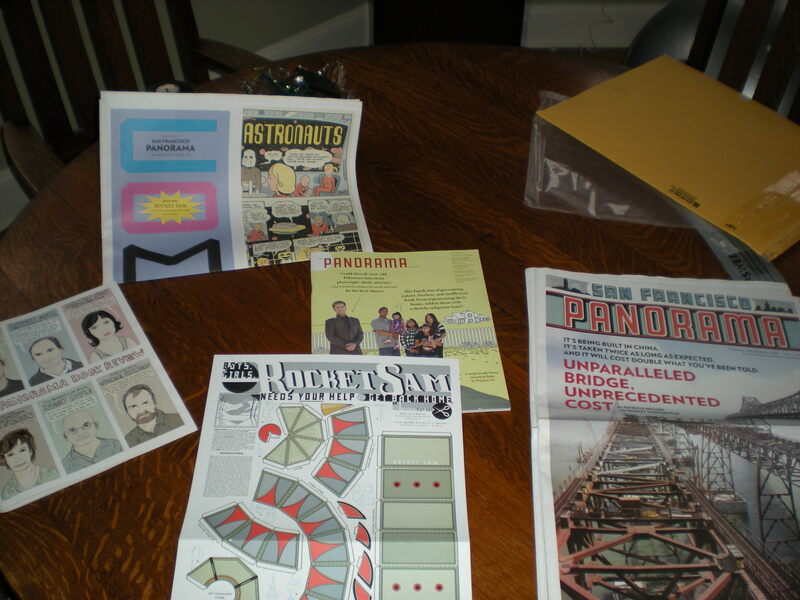 ), movie reviews (by kids), pullout posters, puzzles, and even a paper cut-out of a carousel created by artist, Chris Ware. 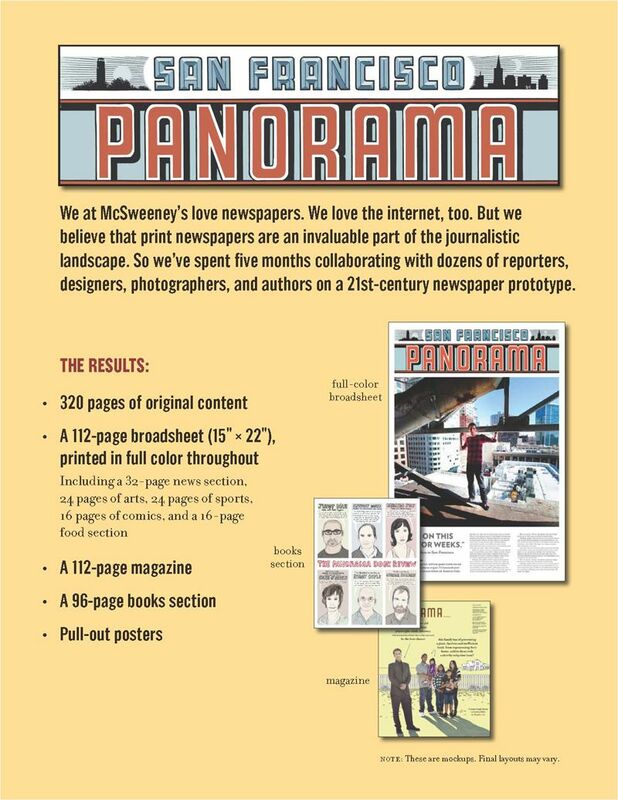 One of the creators’ original goals in developing Panorama was to put out a newspaper that didn’t cost a bomb and didn’t require a huge circulation to make it profitable. On the day of publication it was $5 in San Francisco. We paid $16 (plus shipping) to have it delivered to our door. In an interesting twist, Panorama makes a story out of their financial model. They include a piece on the cost of producing their product and take a stab at explaining the difference between replication and fixed (editorial) costs. Nice idea. My son brought this amazing creation into our house. He’s the online editor of his high school paper, and follows trends in journalism. He heard about it online and ordered a copy, which was delivered to our door through the mail, in a handsome plastic pouch – all 15 x 22 inches of it. On the day it arrived, we spread it all out on the dining room table and oohed and ahhed over its contents. Michael Chabon…Junot Diaz… David Eggers… Roddy Doyle… Daniel Alarcon! Some of my all-time favorite writers, gathered up in one mighty attractive package. According to Eggers, “It is our unorthodox belief that the Web and the newspaper can coexist, but that physical forms of the written word need to offer a clear and different experience.” Well, he’s certainly done that. I’ve relished this thing. And have been reading it for days now. Each time I pick up a new section, I’m delighted all over again. Comics drawn by Art Spiegelman – wow. I don’t normally read the sports section but, hell yeah; I want to hear what Stephen King has to say about the World Series. I delighted in the interview between Miranda July and James Franco and couldn’t remeber who was interviewing whom…but it didn’t matter, it was like sitting in on their conversation, over lunch. An article, by Wendy Todd, about Michelle Obama and “Intimidating Black Woman Syndrome” really gave me something to think about. The piece on the elections in Afghanistan (J. Malcolm Garcia) was a fascinating look at the realities on the ground. And that 58-photo, two-page spread on how to carve and cook a lamb – I ask you, where else would you see that? For the most part, the writers have concentrated on the long-form. The writing is deeply considered. Each article is an excursion and I find myself reading Panorama in the same way that I read the New Yorker. I went through it first, just to see what all was there, deciding what I was going to read (hmmm.. looks like everything). And then, when I have a chunk of time, I sit down to read one article. In depth. At a sitting. Like I am having a meal. Complete immersion. In other words, the Panorama has a place on my bed-side table, along with the short stack of novels that I’m planning to read next. Panorama clearly celebrates writers. The paper is proud of its contributors and lauds them prominently – showcasing their talents and perceptions in the freshest of ways. It must be a writer’s paradise to work on this. A word about design. I just love the look of this thing. It’s elegant and clean, beautifully laid out. The photos are interesting and punchy (despite the low quality paper used by newspapers), with excellent resolution. And there’s just something about that broadsheet – a wiiiide expanse like that gives a journalist all sorts of room to dish up a story in a unique way. The big picture along with the details, photos clustered or stand-alone, vertical or horizontal orientations, commodious headlines, sidebars. They’ve used the real estate well. There’s also a lot of “white” space which gives the whole thing a feeling of expansiveness and headroom (as the name implies… a wide angled view). Even the ads are classy looking (for absinthe!). Apparently, some well-known San Francisco designers worked on it, rendering a few noteworthy pieces like a to-die for diagram of the San Francisco music scene. My only beef about the project is that there isn’t much on science. An interesting article by John Horgan debunking the myth that humans are hard-wired to create war and of course, a lot of environmental coverage, but I could imagine all sorts of compelling stories a paper like this could have included to take a different and fresh look at science in our world. Ah well, it’s my only gripe and they lay no claim to completeness. In fact, the creators state, “We can’t stress enough that the Panorama does not pretend to be definitive in any way.” Ok. The creators refer to the Panorama as a prototype – a one-time thing. Their main objective is to offer up an idea, suggest some new thinking, shake things up a little. I think they’ve done that – handsomely.